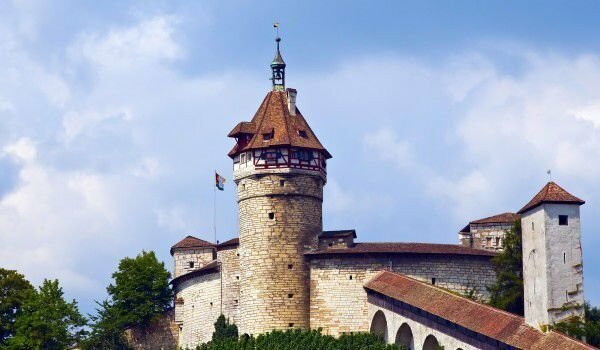 Munot Fortress is an impressive Renaissance castle, which in nearly 400 years is considered a symbol and the pride of the town of Schaffhausen. Schaffhausen is a quiet old town in Switzerland and is located west of Lake Constance, along the Rhine river. If there were no street lamps, modern shops and tourist flows, one without a problem may go back several centuries back in time and imagine how life was bubbling there in the 15th -16th century. Across the old town of Schaffhausen you can see the beautiful old houses with bay windows. The majestic fortress Munot dominates the old part of Schaffhausen from its high hill covered with beautiful vineyards. The height of Munot opens a view to the migratory stream of the Rhine. Across the Swiss city, the oldest part remains in the west and the new residential buildings to the East. Premium vineyard Pinot Noir and Pinot Gris vines surround the south side of the fortress. Visitors to the castle Munot have the opportunity to taste good wine, which is entirely located locally within a kiosk located in the fortress. If you want to climb the hill and castle Munot you can try the difficult steep climb of several stairs leading up to the Renaissance palace, however, if not you can always drive the road which accommodates with parking. The road up the hill is a continuation of the main street, and if you cross the small street you will enjoy many beautiful views over the castle and vineyards. The current oval fortress Munot was built in the 16th century, but the fortifications of that hill above the village had already existed from 1377, as evidenced by preserved documents. Construction of the current castle Munot began in 1564 under the leadership of Heinrich Schwarz. The fortress was built as a fort battle and the original design was of Albrecht Dürer. The keeper of the castle lived in an apartment in the tallest tower of the walled complex. Every morning just at 9 o'clock the bell of fortress Munot would beat in five minutes, just as it was in 1589 when the palace was finalized.